The Griffin iMate USB to ADB adapter allows you to continue to use your favorite ADB mice, keyboards, trackballs, trackpads, hardware dongles, and other ADB peripherals with newer Mac. I use one, and it works great, allowing me to keep using my favorite ADB input devices with my USB-only computers. 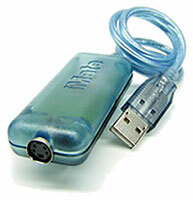 iMate plugs into a USB port or hub at one end, and provides an ADB port at the other. The iMate is also the ultimate cross platform compatibility device. With Windows support, you can now use your existing Mac keyboards, mice, trackballs, and trackpads with both Macs and PCs. Since USB is fully hot swappable, a simple switch box is all you need to control multiple computers. I've found that most ADB keyboards and mice work with the iMate without any driver software, but for devices with custom drivers that won't, you can download the latest version of Griffin's iMate driver from their website. The iMate driver provides the functionality of the ADB manager. This allows ADB devices that require custom drivers to operate on iMacs, iBooks, PowerBook G3s and G4s, Power Mac G4s, and other Macs with PCI or PC Card USB adapter cards. The iMate consists of a small plastic housing containing circuitry and an ADB part attached to a USB cord and connector. You just plug it into a USB port on your Mac or USB hub, plug an ADB device into the iMate, and you're in business. Over the past three years or so, I've used an eclectic variety of ADB keyboards with my Pismo PowerBook, my 700 MHz iBook, my G4 Cube, a WallStreet with a Macally PC Card USB adapter, and my Umax SuperMac S900 tower with a Macally PCI USB adapter. It has always worked flawlessly - except with a DataDesk SmartBoard ergonomic keyboard. I have no idea why, because the SmartBoard requires no dedicated driver. As for pointing devices, I've used a standard Apple ADB mouse, the Anir Mouse, a Contour Perfit mouse, and a Macally two button mouse that has its own programmable driver. The driverless mice worked fine, as did the Macally without its driver loaded (in which instance both buttons revert to a standard click). For a comprehensive list of compatible devices, including mice, trackballs, keyboards, barcode readers, tablets and touchscreens, hardware dongles, and more, see this list on Griffin's website. Activating the Macally mouse driver software causes the S900 to lock up hard, requiring a restart. Fair enough. Griffin warns that programmable devices may require the iMate driver software, as noted above. I downloaded the driver, but still no joy with the Macally mouse, whose own driver software still causes the S900 to crash. However, I'm inclined to blame the Macally driver, which I have seen cause unstable behavior on other Macs (my old PowerBook 5300 for instance) even when the mouse is plugged into a standard ADB port. PCI Macs with USB cards are supported. You need to download USB Card Support 1.2 or later from Apple to use the iMate (or any other USB device). Soft power on (keyboard power on) is supported by Macs with built in USB, but it is not supported by any USB cards, since they have to be powered up to respond to a connected USB device. In general, the iMate serves its purpose admirably, allowing most ADB peripherals - Apple items in particular it seems - to support USB Macs. I especially like the little activity LED on the iMate that lets you know that information is flowing. It's not especially functional, but it is entertaining. Version 1.5.3 provides improved support for hardware protection dongles in classic mode. This version also has a preference pane to select whether you want the iMate to operate under classic (hardware protection dongles, calibrators, and other non-input devices) or OS X (input devices like mice, keyboards, or trackballs). Mac "Wake from Sleep" mode is supported with ADB keyboards using the iMate, but only the power on key is used with external keyboards on PowerBooks G3s. This is different from previous PowerBooks which would awake with any keystroke. PCI Macs with USB cards are supported. You need to install USB Card Support 1.2 or later. Soft power on (keyboard power on) is supported by Macs with built in USB, but it is not supported by add-in USB cards. PC support is generally limited to mouse and keyboard support. This allows for the use of trackpads, trackballs, and bar code scanners/wands that use these drivers. iMacs: Built in support in ROM. iMac updates are required for Rev A and Rev B models (233 MHz) when using ADB devices with custom drivers. Griffin iMate sells for $39.